If Om likes it, so do I ! Truly a lot of fun! I’ll be sailing my Hep Cat more than any of my other boats…of that I am sure! Been waiting for this one and patience has paid off. Another fine addition to the finest boats in SL and this time a pure Hot Rod! Thank you to the Trudeau Team. 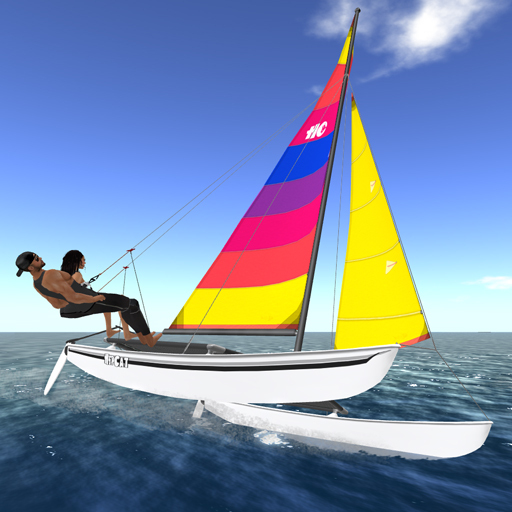 what’s next… a remake of the sailrazor? Think il be getting this Cat for as trip on the weekend, the Demo was lovely. this cat looks so much fun! four years ago the BeachCat were my first one from the great Trudeau’s warft. wouldn’t give any words of sorry for this oldish and flat snappies, no i wouldn’t. But can’t wait to get the new cat! I just read your note above. and included a link to your great images of that boat. Let me comment that I think this boat is rather stable. We used to have a Hobie 16 (80’s) with the sail colors on this page, and the HepCat I just bought is sort-of a time machine. ‘been flying around the Fruit Islands and having a blast. None of the Huds will work, however. Anybody else having problems? or maybe can offer some advice? thanks. Hi Rolf; my guess is your problems are SL-grid related (sim server issues). Please see my note above, posted three weeks ago. SL-server issues are frustrating, I agree, and I wasted many hours trying to find ‘boat script bugs’ in HepCat that turned out to be SL grid issues. JT has the knowledge and insight; I’m just a sailor. However I think the launch version of HepCap was pretty solid and well-tested by many critical skippers. As I mentioned in my prior note, I crewed on Chaos Mandelbrot’s HepCat for over 100 consectutive sims on June 29 without a major problem. Since then I’ve had many ‘grid-problems’ sailing different boats, and I’ve even switched my preferred viewer to improve stability. My guess is that your problem is SL-related, not a HepCat issue. 1. J. Trudeau upgraded her original BeachCat and redesigned the new HepCat based on feedback from several RL small catamaran sailors. If you have recommendations about HepCat design or handling, please send JT a notecard in SL. That sort of feedback is pretty important :-). Sailed this lil cat recently. Gotta say it looks great and it sails like a dream. Absolutely a fun cat. Absolutely worth sailing.